Ryan Autocare is a family owned business established in 1982, we have been serving the people of Falkirk District and the surrounding area ever since. As a local business, customer satisfaction is very important to us and so we strive to maintain a high standard of workmanship of which we are very proud. We are a member of the Scottish Motor Trade Association, and members of The Motor Industry Code of Practice and we are also AA and RAC approved. Our motto “Ryan Autocare does care” is not just an advertising tag line; it is the ethos that drives our business. We have plenty of parking available including dedicated spaces for disabled drivers. We have a range of quality used cars for sale to view online and more in our showroom. 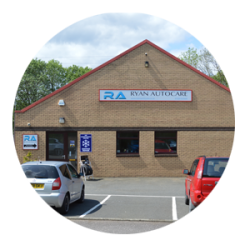 At Ryan Autocare we service and repair all makes and models of car and light commercial goods vehicles including AirCon servicing and repair and diagnostic checks using the very latest technology. I have used other approved garages over a period of many years and wish to state for the record that the level of service provided by all the staff at this garage is of the highest standard. Used this garage over the last six years with several different types of car never had any issue with the work that was done . This is the only garage I would use as I have experienced the very best customer care, fantastic prices and they never tell you that you need something repaired when you don’t need to. I have used Ryan Autocare for many years and have always been satisfied with any work carried out. I have complete confidence in them and know they are very thorough with the work they carry out. Ryan Autocare is people orientated and never lie or cheat when it comes to repairing our vehicles. We have used them now for several years and would not go anywhere else as they have our safety and pocket always. We have also purchased vehicles over several years from them. Please note: By submitting a testimonial, you are giving your consent for us to display this testimonial on our website and related sites for promotional purposes. We will not display your email address or supply it to anyone else.